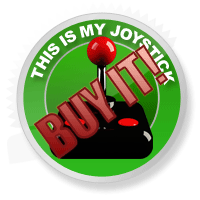 Review: The Secret of Monkey Island SE Review - This Is My Joystick! Wow, this really takes me back! I could have sworn that I bought the original Secret of Monkey Island game when it was first released. That was until I realised that it first went up on the shelves in 1990, and I think that the game’s top class humour would have flown over my head considering I was but three at the time. However, it was definitely a long time ago when I was first introduced to the adventures of Guybrush Threepwood. I’ve been a massive fan of the Monkey Island series since I first picked up the original and since 2000′s Escape from Monkey Island, I’ve been waiting impatiently for another helping. Naturally I was delighted to hear that the first game was being beautified for Xbox 360 users to download, so is the Special Edition just a trip down memory lane for aging swashbucklers like myself? Does it reignite my passion for insult sword-fighting, or should it have stayed buried at the bottom of the briny deep? The Secret of Monkey Island was the game that really put Lucasarts on the map. Its unique artistic style, satisfying puzzles and humour brought the point and click genre to the masses. Two sequels, LeChuck’s Revenge and The Curse of Monkey Island, were released to an equally positive reception, before leaving 2D adventuring for the (admittedly not quite as good) fully 3D Escape From Monkey Island. Since then Guybrush, Elaine, LeChuck and Murray the demonic talking skull (undoubtedly the best character of the series) disappeared without a trace. That was until a mere few weeks ago when the Special Edition, and the episodic ‘Tales of Monkey Island’ were announced with a release date of… NOW!? Way to build the hype guys! The Secret of Monkey Island places you in the breeches of Guybrush Threepwood, a man who arrives on Melee Island with the goal of becoming a pirate. You set off to complete the ‘Three Trials’ so that you can officially be declared a foul smelling, grog swilling swashbuckler, attracting the romantic attentions of Governor Elaine Marley, and the not so romantic attentions of the ghost pirate LeChuck along the way. The story itself is fairly standard stuff; save the girl, kill the evil ghost buccaneer, but the characters and dialogue throughout the game are brilliantly written and hilarious in equal measure. In the first section of the game alone, you’ll meet Stan the bombastic used boat salesman, a half-blind lookout, a walking product placement for another Lucasarts game (Ask him about Loom!) and much more. The script is undoubtedly the strength of Monkey Island, and having a fully voice-acted version of the game only makes this aspect so much sweeter. It’s worth examining every object in this title, talking to every person, because the jokes almost never miss the mark. Probably the only weakness in the narrative is that it hasn’t changed since the original game, meaning that some references are likely to go over people’s heads. For example, the afore-mentioned pirate in the bar who raves about Loom; it came out before the original and has essentially fallen off the edge of the planet. There are some differences, for example they have got rid of the infamous ‘stump joke’ early on, which is quite disappointing. Although I imagine this was done to avoid the same confusion that it caused the first time round. Being a point and click game, not much can be said about the depth of the gameplay mechanic, you point, you click, stuff happens. It’s really quite genius in its simplicity. The interface of the game has been streamlined a bit to make it easier to play with the 360 pad, allowing you to access actions and your inventory with the triggers, and I found that I was able to perform most necessary actions in the game with no more than a few button presses. The puzzles themselves start off simple enough, although you can walk around in circles for a while if you happen to walk past a necessary item. I think that the balance is pretty spot-on; sometimes you’ll be able to use common sense to deduce that you need to use ‘that’ particular item on ‘that’ particular person, while sometimes you’ll need to scratch your head before it comes to you. I never found any of the solutions to be cheap or just completely nonsensical in the vein of the Simon the Sorcerer games for example (“Use butter on vibrating gnome” being a particular favourite of mine), although some of them really do take a lot of brain power to get to the bottom of. In the Special Edition, you can hold down X in order to get a hint about the next step you should take, with the hint getting more specific depending on how long you hold down X. On one hand it’s a bit disappointing to see players given a cheap “out” if they can’t be bothered using their noggin, but I suppose it does help to stop the flow being broken up by spending too long on the one puzzle (although you’ll miss out an a lovely big achievement if you use this feature even once). 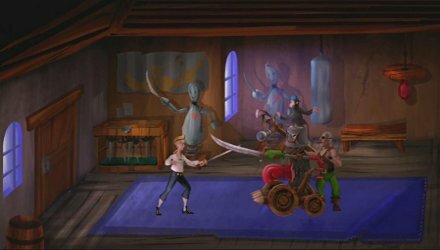 Apart from all the pointing and clicking, a funky little mini game in The Secret of Monkey Island is insult sword-fighting. 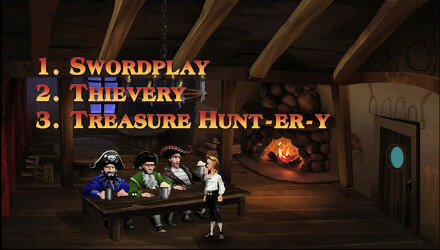 You see, in the world of Monkey Island your tongue needs to be as sharp as your sword. You can pick fights with wandering pirates on Melee Island and trade insults and responses. There is one perfect response for every insult, you learn them as you get into more battles, and the battle will swing in your favour if you can prove that your wit is of a higher calibre than the unwashed scoundrel facing you. Again, the insults and responses very rarely fail to tickle your ribs, and it’s worth picking fights just so you can hear them all. At first glance, the graphics in The Secret of Monkey Island don’t look all that mind blowing. Pressing the back button however, takes you way to back to 1990 as the visuals regress back to that of the original game. Considering the difference of 19 years, you’d expect there to be a noticeable difference, but it’s amazing to think that those kind of graphics were revolutionary back in the 90′s. It shows you just how far the gaming industry has come since then. There might even be a few times during the game where you could see something in the background and have a sudden “So that’s what that was supposed to be! ?” moment, so incomprehensible were the graphics back then. To be honest, the Special Edition is just the original with a very slick new coat of paint, although that’s not necessarily a bad thing considering every location in the game is as interesting as the last. The artistic style that really came into its own in The Curse of Monkey Island just makes every location come alive so much more, even though it’s barely changed at all. It’s just great being able to progress to the next part of the game, and find that everything is almost exactly where you left it 19 years ago, although it’s been given a bit of a polish before you arrived. Similarly, the new character models are familiar, but look sharper, smoother and more refined. LeChuck in particular looks great, and leaves behind a spooky ghostly trail whenever he moves, just to properly emphasise that he’s… well, a spooky ghost. The soundtrack of the Special Edition, in a similar vein to the graphics, is just sharpened version of the original score. Again, I had no problems with this as the music in the game is catchy and charming and fit into the whole tone of the game seamlessly. One major improvement over the original however is the inclusion of a full voice cast, which was completely absent from the game back in the days of MIDI sound, pixelated characters, witch burnings and jousting. Most of the voice actors who contributed to the 3rd and 4th games of the series return in the Special Edition, and they all do as cracking a job as they did in those instalments. Guybrush in particular is really well done, I loved hearing him half-heartedly deliver a comeback after I accidentally chose the wrong option while insult sword-fighting, only to yell the classic line “Look behind you! A three headed monkey!”, after losing his sword. This element of the game is probably the biggest improvement since it provides a feature that didn’t exist back in the original, and you can really tell that a lot of effort has gone into the sound as it really does improve the overall quality of the title. Avoid it, try it or buy it? This is probably one of the only arcade games that I’ve been genuinely excited about since the Xbox 360′s inception, and despite it being the same game with bells on, I have no regrets about shelling out. Newcomers to the series will probably finish The Secret of Monkey Island in around six-eight hours, depending on how much the hint feature gets used, while seasoned pirates will probably have LeChuck back in the Davy Jones’ Locker in three or four. For gamers who have never come across the adventures of Guybrush Threepwood, I would highly recommend this as an ideal introduction, while everyone else could have much worse trips down memory lane. While I’ll probably get more satisfaction out of the brand new adventures in Tales, I would have no hesitation in retreading slightly less ancient ground again if a Monkey Island 2 was also to be given the Special Edition treatment.